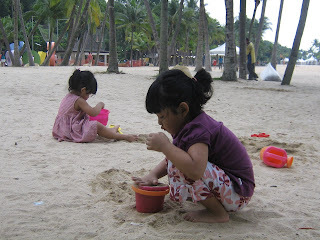 M3rNi3: To Siloso Beach We Went ..
My hubby and I brought our kids to Sentosa after Tihani's school orientation. So went went, our bags packed with drinks, tidbits, extra clothing and toys for the kids to play with by the beach. We head down to Siloso Beach at Sentosa. While me and hubby lay down our mats and sat chillin', my daughters played with sand. 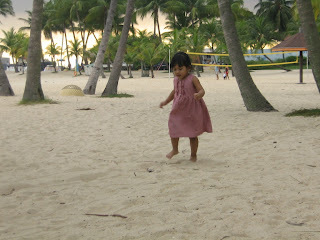 There she is, Auni, enjoying herself, running on white sand amidst the lush green trees. There are the kids, trying to build sandcastles. 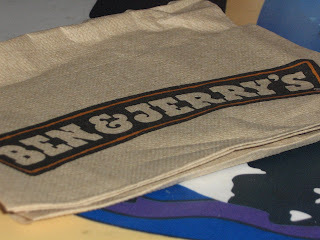 After a fun time by the beach, I gave the kids a lil treat of Ben & Jerrys. 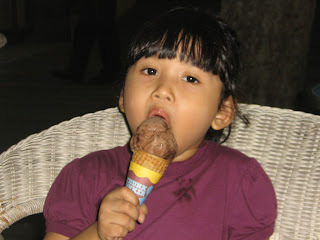 Dats Tihani enjoying her ice cream. We left the beach when the skies turned dark and lightning started to strike.